I recently needed an upgrade from my 4 year old, 6 pound Lenovo IdeaPad Z580 laptop that doesn’t last close to an hour on battery life anymore, so I went shopping around to find a lighter weight upgrade. 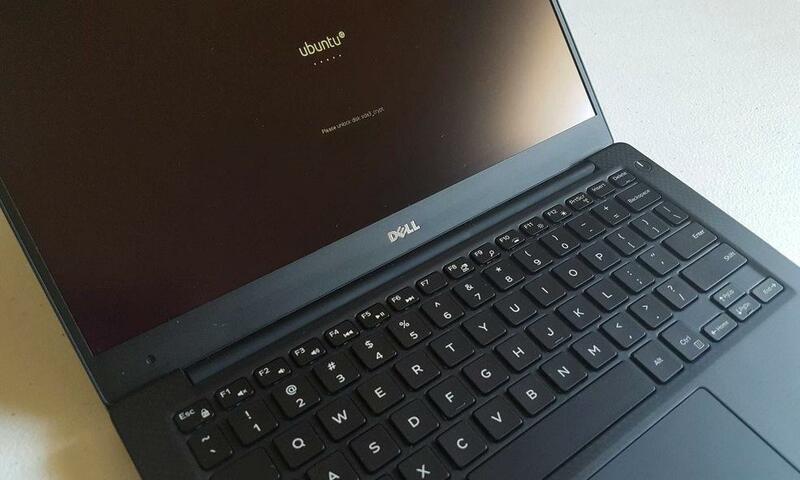 After seeing a bunch of good customer reviews, video reviews and seeing it had decent Linux support, I landed on choosing the Dell XPS 13 i5 Skylake ultrabook as the replacement. Some things I didn’t need in the replacement criteria were the touch screen. It’s just a personal preference that I don’t want on a laptop and didn’t want to sacrifice battery life for something I don’t use, along with being a lot cheaper. What surprised me, was that the 256 GB SSD option was priced at $615+ more than the 128 GB SSD option. 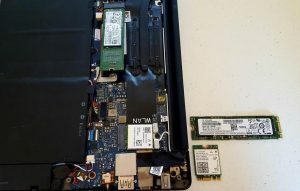 I already knew I was going to swap out the M.2 SSD as soon as it came for a 500 GB SSD priced at $180, so that saved quite a bit of money buying it separately. When it first came in the mail, I was really trying and willing to give Windows 10 Home a shot as I hadn’t used it in while since Windows 7 and it’s their latest *newest* offering. This soon changed on running into issue after issues, trying to get the operating system updated to have the latest Windows updates and security patches. The Bios update went pretty smoothly. I then installed their 4 Urgent other upgrades to get it up to speed with Windows 10 too. These also installed just fine & didn’t have many issues, just a few reboots needed for each one. This is when it came time to update Windows itself. I naturally thought it would be as simple as going to the Windows Update settings screen & letting it do its’ work. I was met with a problem error screen and a [Retry] button which didn’t do anything. Stopping the BITS, Cryptographic, MSI Installer and the Windows Update Services via cmd prompt as admin user. Using the Windows Update Automated Troubleshooter. Each time in ‘Find and Fix problems’ it said it found issues & they were fixed, but still no updates installed. Tried a clean Windows 10 install from the recovery boot mode, to do a clean install. Thinking it may have been some option I selected in install. But still nothing. After many hours of debugging later, I attempted to download their Media Creation tool in https://www.microsoft.com/en-us/software-download/windows10/ (Even though it was already Windows 10) . It seems to have kickstarted the Updates, but it soon installed a clean Windows 10 install with none of the Broadcom wifi chips drivers. I know the correct way is to always get the Windows ISO from Microsoft themselves, and not deal with the bloatware that may come pre-installed. But at this point, with no internet and the laptop not having an Ethernet cable to hardwire it in, I gave up. Knowing I wasn’t going to be using the SSD in it with Windows anyways, I began switching it to a Linux computer (yay!). It was relativity easy to open it up with the help of a T5 screen driver & a Phillips #0 screwdriver for the 1 screw under the spring-loaded flap that shows the laptop model details. I was soon upgraded to a new clean 500 gigabytes M.2 SSD and the better supported Intel Wifi chip. On all previous laptops and desktop, I’ve had bad experiences with anything Broadcom chips and Ubuntu support related. So I avoid it as much as possible, to save precious debug time of having to find and download custom github repos and also compiling the libraries. Only to have to redo compiling them on every core Ubuntu update. Note: The RAM is soldered onto the motherboard, so there’s no manually upgrading that. Which is why I chose the 8 GB RAM option, as it will stay on there for the life of the laptop. After inserting the bootable flash drive with the latest Ubuntu Desktop Xenial Xerus version. I booted up and went through the regular Ubuntu installer to get it installed without any issues. I was met with the Dell Support Assist Bios screen after the first boot with new hardware, but it didn’t have any issues recognizing the new SSD or anything else. After the Ubuntu install, the Wifi card worked right out of the box and didn’t run into any compatibility issues. The mouse trackpad, screen, brightness shortcut, volume mute/up/down key worked too. (Although it doesn’t seem like the media shortcut: previous, play/pause & next keys do). I just needed to fix the display resolution, as text was tiny while first logged in. For my install, I also have the encrypted LUKS filesystem along with the Encrypted Home folder for users. I’ve yet to have data loss issues on it and it looks to also be fully supported & compatible, so far. By fault of my own: There’s been a time where I’ve accidentally cleared the fat32 /boot/efi partition on my previous LUKS disk mounted laptop. This was due to trying to mount a 2nd SSD and then installing a different Ubuntu version on it (thinking it wouldn’t touch the 1st primary SSD boot record that was already there, it did, lesson learnt). Don’t quite remember the details of how I recovered. But after much debug time, I was able to find out the issue with the Boot-Repair utility, along with the Ubuntu live bootable USB to recover/backup my home files and do a clean install again. It’s only been a few days, but the only issue ran into was when restarting from hibernation the machine reboots. To fix: I logged into BIOS by pressing F12 to change RAID to AHCI mode in the settings, and that fixed the reboots. This then got the Wifi networking working again without needing to reboot within the current logged in user session. I may have to touch up on the Dell USB-C to HDMI/VGA/Ethernet/USB Adapter in a follow-up post later. So far out of the box, it has only supported the HDMI & VGA to external monitors. Not both at the same time for a 3 screen multi-monitor setup though. 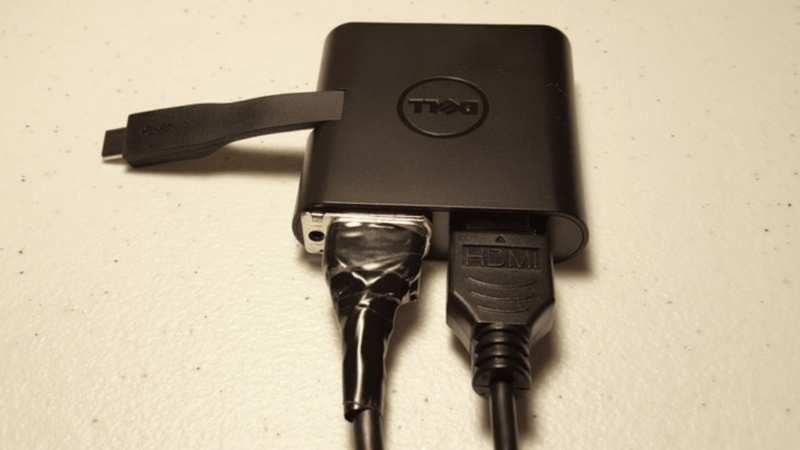 By design it doesn’t seem like the HDMI and VGA cables fit at the same time, so I hacked up an extra VGA cable by using pliers to remove the blue casing with screws that lock it into cases and cutting the metal hole on the right side to both fit, but no luck getting both to work simultaneously. The xrandr command will show that both screens are detected. For USB/Ethernet in both attempts, I haven’t been able to get the external USB to recognize a flash drive or the Logitech mouse usb dongle. I also attempted to plug in an Ethernet hardline on the other side, to test getting internet but it also doesn’t seem to recognize it, even though the green light on the adapter does light up. We will have to re-visit making USB/Ethernet compatible, some missing updates or find an alternative but I could live with only HDMI working for now. Let me know if you have some better alternatives! When I was in the market for a new machine, I was shopping entirely based on specs. I ended up going with the XPS 15, which isn’t too different from your XPS 13. Mine came with the touch screen & while it works great with gMaps & Stellarium, usually I keep it turned off. I’m kind of surprised to hear of your Windows problems during install. I figured you were just going to put Linux on it and just forget about Windows. Mine came loaded with Windows 8. Immediately installed Win7 and it was off to the races. Got my drivers installed (there was only one I couldn’t find – I think it was the Intel Chipset driver). Anyway, aside from some minor maintenance of moving parts (both CPU fans & battery replaced), it’s been rock solid for almost 3 years now, and it will only blue screen when I am stupidly pushing an already memory-starved system. If they had a 32gb option at the time, I would’ve gone for it, though I can certainly work with 16gb just fine. Since you’ve been fiddling with it for a few days, how’s your multi-monitor setup coming along? I still have the display problem with usb-c adapter, what did you do exactly with xrandr ? I ended up not spending further time configuring it, since I couldn’t exactly get it to work. So I fell-back to using VGA for a secondary display, which appears to have worked out of the box. It is WordPress, just the default twentyseventeen theme with customizations for homepage & post page tweaks.